Thuja tablets are a homeoepathic remedy used for sarcoids in horses. They can be used alongside the cream. A cream traditionally used for sarcoids and other abnormal growths. Our thuja cream is formulated useing only the very best ingredients, to produce an anti-viral cream that is cooling, soothing, drying and astringent. Our Thuja cream is safe to use on even the most sensitive areas and will not harm even if ingested, apply once or twice daily. Below are some recent questions we've received regarding Thuja Cream, including answers from our team. As this is a herbal product there is no recommended amount to apply so you can regard it as safe in any case. Start by applying one or twice a day and continue until you see a difference. If no difference is noted in three months, it would be worth discontinuing treatment and trying another remedy. It should also have no detrimental effect on the skin, but if you do develop concerns, stop using the Thuja cream and the signs should soon settle down. Hi, what is the dosage of tablets for a 450kg native pony? Unfortunately there are no exact guidelines for the dosage of Thuja 30c tablets, although the suggested dose is generally around 2 tablets a day for 5-7 days. Hi just wondering if this is safe to use near the eye? My horse has a sarcoid next to his eye and dont want to use if not safe cause he moves and rubs his eyes after other creams have been applied. This appears to be a very safe and non-irritating product. Obviously you should aim not to get any in the eye, but it some gets in there after applying it, I would not expect it to cause trouble in fact. Obviously if you see any signs of irritation, you should stop treatment and it should then settle very soon. This is a herbal product which does not have a measured strength in either pharmaceutical or homeopathic terms. The percentages of the different herbs used would give a sort of measure but have not been provided to us by the manufacturer. They will however be in descending amounts as you read the ingredients list provided in the description. Generally only licensed pharmaceutical products have scientific proof of efficacy. Others are supported by observations and empirical assessments. The products can still be immensely useful, but are usually taken on the basis of faith and trust in the individual product. After the 4 weeks of giving the tablets how long do you need to give a break before starting the tablets again? There is no need to wait, carry on giving until a response is noted, then stop. Obviously if no response is noted after three months of giving another remedy may be needed. Dosage opinions seem to vary so much for the tablets. I have a youngster (rising 4 warmblood) almost 17H best guess on weight 575. I have purchased your thuja occ 30.....can you advise optimum dosage please. Since this is a homeopathic remedy, there is no scientifically evaluated dose recommendation. Different homeopaths have different ideas and they might say that each individual needs to be considered as a unique case, so there cannot be a blanket recommendation. Personally I would suggest 6 tablets twice a week for 4 weeks. This is within the ranges commonly given. There are no known side-effects whatever dose you give, so you can regard it as very safe in any case. Would either of these products be suitablefor a viral wart on the gums of a dog aged 10? 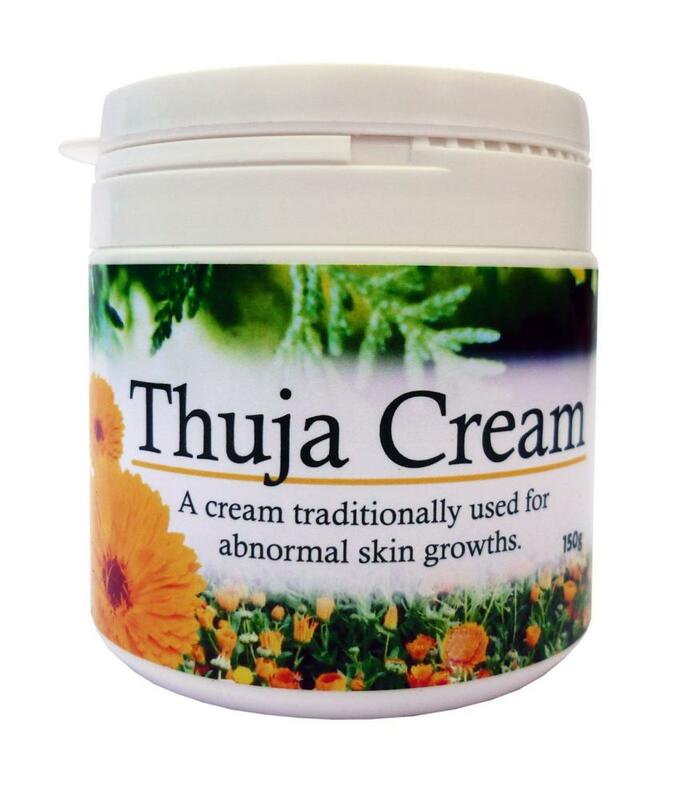 How much thuja is in this cream? Hi, please could you tell me how much actual thuja is in this cream? I think that homeopathy is rubbish and I want a cream that contains thuja, not water that was once exposed to thuja. Thuja cream is often referred to as a homeopathic remedy but the manufacturers do not state this to my knowledge. They are actually manufacturers of herbal remedies which are completely different, though many people seem to consider them as equivalent in some way. However the manufacturers do not state how much Thuja is actually in the cream which is indeed disappointing. I have contacted them about this today and will update our website listing if we get greater detail from them. For the time being I would regard it as a herbal product containing an unknown concentration of Thuja and other herbs. It is in fact a very popular product which usually means that it is found to be effective in at least a proportion of cases.